Slydial connects your call directly to voicemail, allowing you to skip the conversation and just leave a voicemail. And with its new group messaging feature, you can now send a pre-recorded voicemail to up to ten people at once! Use slydial to sing happy birthday when you're in a hurry, explain a report that's too complicated to email, or to navigate an awkward conversation. Increase your efficiency and sincerity at the same time; discover a better way to communicate. Download the app from iTunes or Google Play and start using slydial for free. Don't have a smartphone? No problem, just dial 267-SLYDIAL and follow the prompts. Love slydial? Want to slydial even faster? Sign up for a Premium slydial subscription to skip the ads and get connected more quickly! Receive a one-month free trial with a Premium Monthly or Annual subscription. Don't leave anyone out! Sign up for our Premium Group slydial subscription and send one voicemail to multiple phone numbers at once. This feature allows you to keep all of your friends in the loop on the fly. With a Premium slydial subscription, you can register up to two phone numbers from which to slydial. Add contacts to your online account and use the Click2slydial feature to individually message them from your web browser. Download the slydial app from the iTunes App Store or Google Play. Sign into your account or create a free one. Choose a contact to slydial or manually enter the phone number. The app will connect you to our access number and then connect your call. Once you leave your personalized voicemail, simply hang up. Dialing from a landline? Simply 267-SLYDIAL (267-759-3425) to utilize the service. At the prompt, enter the US mobile phone number of the person you want to reach and slydial will connect you to their voicemail. Leave your message, sit back, and relax. With the basic slydial service, you can call 267-SLYDIAL and place unlimited advertising-supported calls through the app for free. With a Premium slydial subscription, you can enjoy rapid connection to voicemail without the ads, as well as expanded features. Slydial offers the Premium plans below. Plans can be purchased separately or together. *You must purchase a Premium Group slydial subscription to prerecord a message. through the slydial app or send one live voicemail to one phone number. 10¢ deducted for each successfully delivered voicemail. Credits prepurchased in $5.00 increments. NEED TO CONTACT MORE THAN 10 NUMBERS? TRY SLYBROADCAST! *Does not include the ability to pre-record voicemails. *Renews monthly *Renews yearly *Send a message to hundreds of numbers at a time with slydial's sister service, slybroadcast! Slydial is a free voice messaging service that connects you directly to someone's mobile voicemail. Slydial is a service of MobileSphere. WHAT'S IN THE NAME "SLYDIAL"? While the word 'sly' can draw up connotations of being wily, crafty or mischievous (e.g. 'sly like a fox'), it can also mean clever, resourceful and efficient. We created slydial for people who appreciate clever, resourceful and efficient methods of communication, whether they exist in everyday tasks, business interactions, matters of the heart or ... clandestine operations. Anyone who is short on time, wants to avoid an awkward conversation, or doesn't want to bother someone, but needs to leave them a voicemail. No matter where you are in the walk of life, be it a college coed, a working stiff, a soccer mom, or an empty nester, we guarantee you that there will be situations in your life everyday where slydial will be helpful to you. DO YOU HAVE SLYDIAL APPS? Yes. Slydial has an app for the iPhone and the Android. The slydial app allows you to quickly connect to the number or contact of your choice without dialing the access number directly. The app also allows you to view your slydial history, account balance and contact the slydial Customer Care team. slydial works from any U.S. mobile phone number, excluding VoIP numbers. HOW DOES SLYDIAL DIFFER FROM OTHER SERVICES? Well to the best of our knowledge, there is no other service that does quite what slydial does. While some mobile phone carriers enable their users to reply to or send voicemails within their voicemail system, there are significant limitations. For example, voicemails can only be sent to users with the same carrier (e.g. Verizon) and more specifically only to users within a certain geographic area (e.g. New York metro). slydial connects you directly to the voicemail of any U.S. mobile user, regardless of their carrier or geographic location. WHAT HAPPENS ONCE I PLACE A SLYDIAL CALL? WILL THEIR PHONE RING? In most cases the person you're slydialing simply receives a new voicemail alert a minute or so after you leave them a message. With some mobile phones, the recipient's phone may emit an abbreviated "half ring" before going directly to voicemail. On occasion, with some mobile carriers, you may hear a ringing sound/tone while you are waiting to be connected to the recipient's voicemail. This is not the recipient's phone ringing; this is the recipient's mobile carrier playing a ring tone while they attempt to locate the recipient. DO I NEED TO SIGN UP FOR SLYDIAL IN ORDER TO USE IT? No. We do not require you to sign up for the service in order to use it. Just dial 267-SLY-DIAL (267-759-3425) and you are ready to go. 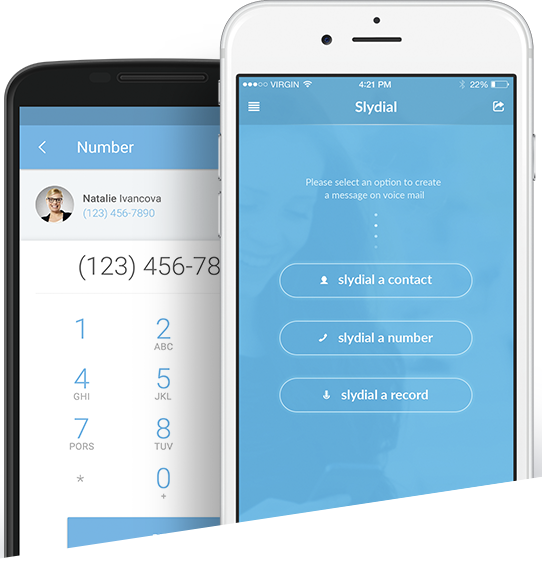 However, to enjoy advanced features including slydial apps for iPhone and Android smartphones, as well as rapid connection to voicemail with NO advertising, join slydial Premium. Learn more. IS SLYDIAL REALLY FREE FOR THE USER? IF I DON'T WANT TO LISTEN TO THE IN-CALL ADVERTISING, CAN I JUST PAY TO USE SLYDIAL AD FREE? Yes. What you're talking about is our Premium slydial subscriptons. The table below shows you the details of the types of Premium plans we offer. Plans can be purchased separately or together. *To send a voicemail to up to 10 phone numbers, you must subscribe to our Premium Group slydial plan. All Premium subscriptions are advertisement free with access to the slydial app and our web-based Click2slydial feature. The Click2slydial feature allows you to slydial a contact or phone number from your browser. This comes in handy when using slydial with a landline. We will bridge the call between "Phone Number 1" on your account and the number you are slydialing so you can skip the access number. CAN I USE SLYDIAL FROM A LANDLINE PHONE? Yes. Slydial works from any phone - landline and mobile. If you are calling from a landline phone, dial the slydial access number 267-SLYDIAL (267-759-3425), follow the prompts, and your call will be connected to the slydial service. CAN I SLYDIAL MULTIPLE PEOPLE AT ONE TIME? Yes! However, this feature is only available for users with a Premium Group slydial subscription. With this you can send one prerecorded voicemail to up to ten phone numbers at once. All campaigns are sent out via the slydial app. After a campaign is complete, visit the Group Reporting section to view your campaign results. To record a voice message, open the slydial app and click Record a Message. Name your message and tap the microphone icon to begin recording. Once you are done recording, click the stop icon then click Send. On the next page you can add up to 10 phone numbers you want to recieve your voice message. Tap Choose a contact to add a phone number that is saved in your address book. To manually enter a number, tap Enter a number and type a 10-digit number. When you have added all of the numbers you want to receive your message, click Send. Visit the Group Reporting tab to view your results. Contacts with a "✔" successfully received your voice message. Contacts with an "X" did not successfully receive your voice message. I HAVE THOUSANDS OF NUMBERS TO CALL. WILL SLYDIAL WORK FOR ME? Sure, but we have a better solution. We offer a service called slybroadcast. Slybroadcast uses the same patented direct to voicemail technology with a few additional features including a customizable caller ID, campaign scheduling and an easy to use web interface so you can send campaigns from your computer. CAN I USE SLYDIAL TO CONNECT TO THE VOICEMAIL OF A LANDLINE PHONE NUMBER? No. Slydial only works to connect to the voicemail of a U.S. mobile phone user. DOES SLYDIAL WORK FROM AND TO ALL MOBILE PROVIDERS? Slydial works with all major U.S. wireless providers. DOES SLYDIAL WORK TO ALL U.S. MOBILE PHONES? No, there are some numbers that simply cannot be 'slydialed'. For example, you cannot slydial someone who has a prepaid mobile phone, does not have a voice-mailbox on his/her phone, a full voice-mailbox, or a third-party voicemail service (e.g. Google Voice, Youmail). Additionally, Google Voice numbers or other VoIP numbers cannot be slydialed. On some occasions, we temporarily may not be able to complete your call due to things like network congestion, network interoperability or local number portability (LNP). WHAT CALLER ID APPEARS ON THE RECIPIENT’S VOICEMAIL? Slydial never blocks your caller ID, so your telephone number will always appear on the other person's phone. The number you enter into the slydial app must be the same as your native cell phone number. If you enter a different phone number into the app, this will not change your Caller ID. The app will not work if an incorrect phone number has been entered in to your app. If you have Caller ID blocked on your phone, try dialing *82 before you dial 267-SLYDIAL to unblock Caller ID for a single call. MobileSphere is a leading-edge provider of global wireless communications solutions leveraging the migration from fixed to mobile communications. A communications technology company, MobileSphere focuses on providing mobile messaging and mobile telephony solutions to service providers, enterprises, universities and consumers. To learn more about MobileSphere, please visit our corporate website. CAN I USE THE SLYDIAL LOGO? Yes.The logo is available to use and can be downloaded here. Please adhere to all stylistic guidelines detailed in the slydial Quick Reference Logo Guide. CAN I CANCEL MY SLYDIAL ACCOUNT? Yes. If you wish to cancel your slydial account, send an email to our Customer Care Team at slydial@mobile-sphere.com. Be sure to include your registered phone number and email address. Thank you! Your email address has been subscribed. Get the latest updates and promotions from slydial. © 2019 MobileSphere. All Rights Reserved. Thank you! Further instructions will be sent to you once your email address is confirmed. Slydial is a service of MobileSphere LLC (the "Service"), accessible via the phone, mobile phone, web browser, text messaging, email, links created by 3rd parties, and any 3rd party applications which incorporate the MobileSphere Service via Application Programming Interfaces (APIs). Customer must provide (1) all equipment necessary, (2) provide for Customer's connection to equipment, and (3) pay any fees related with such connection to use the service from all methods of access described above. The site is provided by MobileSphere on an "as is" and on an "as available" basis. To the fullest extent permitted by applicable law, MobileSphere makes no representations or warranties of any kind, express or implied, regarding the use or the results of this web site in terms of its correctness, accuracy, reliability, or otherwise. MobileSphere shall have no liability for any interruptions in the use of this Website. MobileSphere disclaims all warranties with regard to the information provided, including the implied warranties of merchantability and fitness for a particular purpose, and non-infringement. Some jurisdictions do not allow the exclusion of implied warranties, therefore the above-referenced exclusion is inapplicable. MobileSphere shall not be liable for any damages whatsoever, and in particular MobileSphere shall not be liable for any special, indirect, consequential, or incidental damages, or damages for lost profits, loss of revenue, or loss of use, arising out of related to this web site or the information contained in it, whether such damages arise in contract, negligence, tort, under statute, in equity, at law, or otherwise, even if MobileSphere has been advised of the possibility of such damages. Some jurisdictions do not allow for the limitation of exclusion of liability for incidental or consequential damages, therefore some of the above limitations is inapplicable. Customer agrees to indemnify and hold MobileSphere, its parents, subsidiaries, affiliates, officers and employees, harmless from any claim or demand, including reasonable attorneys' fees and costs, made by any third party due to or arising out of Customer's use of the Service, the violation of this Agreement, or infringement by Customer, or other user of the Service using Customer's computer, of any intellectual property or any other right of any person or entity. MobileSphere reserves the right to modify or discontinue the Service with or without notice to the Customer. MobileSphere shall not be liable to Customer or any third party should MobileSphere exercise its right to modify or discontinue the Service. Customer acknowledges and accepts that MobileSphere does not guarantee continuous, uninterrupted or secure access to our website and operation of our website may be interfered with or adversely affected by numerous factors or circumstances outside of our control. If you are not completely happy with the slydial Voice Messaging service, you may return it within 30 days of the initial purchase date for a full refund. To request a refund, please email slydial Customer Care at slydial@mobile-sphere.com or call 617.399.9980. Product specifications and other information have either been provided by the Vendors or collected from publicly available sources. While MobileSphere makes every effort to ensure that the information on this website is accurate, we can make no representations or warranties as to the accuracy or reliability of any information provided on this website. MobileSphere makes no warranties or representations whatsoever with regard to any product provided or offered by any Vendor, and you acknowledge that any reliance on representations and warranties provided by any Vendor shall be at your own risk. All content included or available on this site, including site design, text, graphics, interfaces, and the selection and arrangements thereof is © 2016 MobileSphere, with all rights reserved, or is the property of MobileSphere and/or third parties protected by intellectual property rights. Any use of materials on the website, including reproduction for purposes other than those noted above, modification, distribution, or replication, any form of data extraction or data mining, or other commercial exploitation of any kind, without prior written permission of an authorized officer of MobileSphere is strictly prohibited. Customers agree that they will not use any robot, spider, or other automatic device, or manual process to monitor or copy our web pages or the content contained therein without prior written permission of an authorized officer of MobileSphere. Slydial is proprietary marks of MobileSphere. MobileSphere's trademarks may not be used in connection with any product or service that is not provided by MobileSphere, in any manner that is likely to cause confusion among customers, or in any manner that disparages or discredits MobileSphere. All other trademarks displayed on this website are the trademarks of their respective owners, and constitute neither an endorsement nor a recommendation of those Vendors. In addition, such use of trademarks or links to the web sites of Vendors is not intended to imply, directly or indirectly, that those Vendors endorse or have any affiliation with MobileSphere. Pursuant to Section 512(c) of the Copyright Revision Act, as enacted through the Digital Millennium Copyright Act, MobileSphere designates the following individual as its agent for receipt of notifications of claimed copyright infringement. MobileSphere retains the right, at our sole discretion, to terminate any accounts involved with botnets and related activities. If any hostnames are used as command and control points for botnets, MobileSphere reserves the right to direct the involved hostnames to a honeypot, loopback address, logging facility, or any other destination at our discretion. Slydial is a general audience website. Due to the Children's Online Privacy Protection Act of 1998 (which is available at http://www.ftc.gov/ogc/coppa1.htm), you must be at least thirteen (13) years of age to use this Service. Slydial is a service of MobileSphere. MobileSphere. ("MobileSphere") is committed to protecting the privacy of our visitor's personally identifiable information. To better protect your privacy, we provide this notice explaining our online information practices and the choices you can make about the way your information is used at our site. MobileSphere respects your privacy and the privacy of your telephone number data. Your name, telephone number and email address, and the telephone numbers you have slydialed, are stored and maintained by us in a secure and encrypted manner. MobileSphere has put in place physical, electronic, and managerial procedures to safeguard and help prevent unauthorized access, maintain data security, and correctly use the information we collect online. All information submitted is protected by our secure server, which automatically encrypts your personally identifiable information so that it cannot be read while traveling over the Internet. MobileSphere does not sell or market contact information about our customers. In other words, we will not sell or market to any third-party your name, phone number, email address or contact information. MobileSphere also does not use internally, nor does it sell or market, our customers’ slydialed phone numbers. We will not use, sell or market to any third-party the telephone numbers in your lists or numbers you have slydialed. If you have any questions regarding this statement, or would like more information on our privacy , please contact us at slydial@mobile-sphere.com. Your security and the security of your data, is of paramount importance to us. Thank you! All inquiries are answered from 9am - 5pm ET Monday through Friday (not including Holidays.) Please allow 1 to 2 business days for a response. Slydial is a service of MobileSphere. MobileSphere is a leading-edge provider of global wireless communications solutions, focusing on providing mobile messaging and mobile telephony solutions to service providers, enterprises, universities and consumers.